What a great accompaniment to a pre-dinner beer on St. Patrick’s Day! The “shamrock” is made with a shamrock cookie cutter and sliced avocado. Who’d have thought to pair corned beef and avocado? The California Avocado Commission! Cute appetizers for St. Patrick’s Day. Photo courtesy California Avocado Commission. 1. MAKE shamrocks. With the peel still on, slice four slices (¼-inch thick) from the sides of the whole avocado. Remove seed from center section and slice the avocado in half lengthwise. Peel slices. 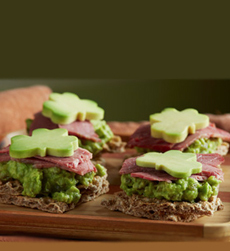 Using a small shamrock-shaped cookie cutter, cut shamrock-shaped avocado pieces for each cracker. Cover surface with plastic wrap so avocado doesn’t discolor; set aside. 2. PLACE remaining avocado in a small bowl and stir in pickles. Spread avocado mixture on each cracker. 3. TOP with two squares of corned beef, then an avocado shamrock. Serve.